Questioning the claims of Maharashtraʹs police special anti-Naxal unit, C-60, of having killed at least 40 ʹMaoistsʹ in two different encounters in Gadchiroli district, a 44-member fact-finding team has released its report, and has termed the encounters fake. The report ʹMassacres Masked as Encounters: The New State Policy for Development in Gadchirolʹ, released on Monday, was drafted after visiting the sites of the alleged encounters in the Gadchiroli district. The team comprised members from three human rights networks or organisations: Co-ordination of Democratic Rights Organisations (CDRO), Indian Association Peopleʹs Lawyers (IAPL) and Women against State Repression and Sexual Violence (WSS). On April 22, an alleged encounter took place in Boriya-Kasnasur of Bhamragarh tehsil of Gadchiroli district, Maharashtra. 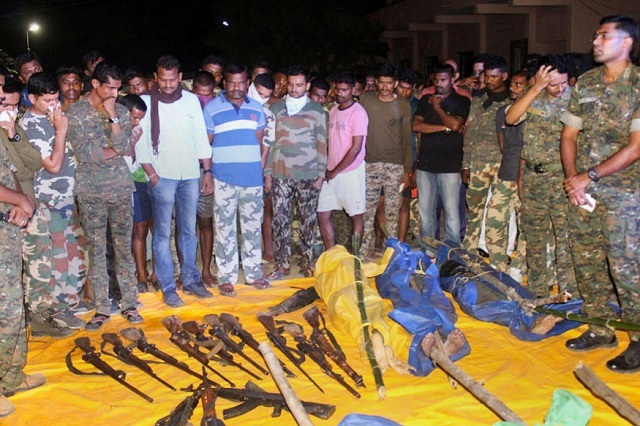 The police issued a list of 16 people with a press note next day, saying that the Naxalites have been killed. On April 24, the police claimed that 15 more bodies were found in the Indravati River. Since then, the count of the deceased has gone up to 40. Terming it as a fake encounter, the fact-finding team has asked how there was no causality or even injuries to the security persons during the encounter, which led the death of at least 40 Maoists. The team has found that ʹthe C-60 force did not recover the bodies immediately. Important evidence of the alleged encounter, including letters, photographs, and identity cards, appear to have been left lying around for days after the encounter. No photographs of the original site or that of the bodies had been made available during the press release by the police on the 22nd April 2018. Only selective journalists were given initial access to the site and their reports seem based entirely on police narratives. It also seems suspicious that 15 bodies were found on 24th April, two days after the said encounter, and all at the same spotʹ. When the fact-finding team reached Boria, there was a huge presence of security forces in the village and the team found that the villagers were barred from communicating with the fact-finding team. The team was also followed by the forces. The team does not believe that the killings were isolated sporadic events. It seemed to be part of a larger trend of police atrocities in the area. The region has been continuously witnessing police brutality for a while. On February 5, two young men, Ramkumar and Premlal of Koyanvarsha village, who had gone hunting for birds, were picked up by the security forces. They were forced to accept that they were Maoists and when the men resisted these claims, they were held back forcefully. However, one of them, Premlal, managed to escape and shared the whole story with the visiting team. On February 6, the villagers went back to the place where the men had been picked up from. They found bloodstains, burnt remains of Ramkumarʹs voter ID card and remains of the bird they had hunted, at the spot. This led them to suspect that Ramkumar had been killed. Once they reached the Gadchiroli Police station, they found Ramkumarʹs body there. Later, bribes were offered to the villagers by the police to keep quiet. The thumb impressions of the family were taken on a letter claiming that the men had links with the Maoists at the Hedari police camp where they went to register a complaint. The fact-finding team has narrated in detail how the villagers are being tortured by the police. Condemning the state policy of encounter killing, the team has put forward a number of demands: judicial enquiry into the fake encounters at Boria-Kasansur, Rajaram Khandla, Koyenvarshe, and Rekhanar, withdrawal of all false cases against civil society members who speak up against police atrocities, registration of cases against the persons responsible for indiscriminate use of force and orchestration of false encounters, removal of police and paramilitary from the area, ban on mining in area without gram sabha consent, withdrawal of amendment to The Provisions of the Panchayats (Extension to Scheduled Areas) Act, 1996 that does away with the need for gram sabha consent and preservation of the forests for undisturbed collection of tendu patta (leaves) and bamboo, and guarantee of fair price and sale to the government.